The case page is the central workspace for Committee Members in Review, Promotion & Tenure. 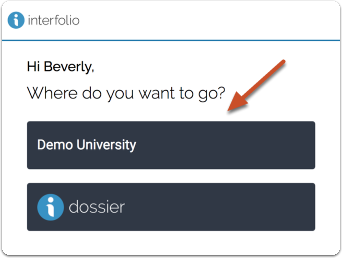 Most importantly, this is where you can access the candidate materials, forms, and communication tools necessary to evaluate a candidate's case. From the case page, Committee Managers and Administrators can also perform administrative functions such as moving a case forward or backward, managing materials, applying case statuses, communicating with candidates and Committee Members, and other functions. This article explains how Committee Members evaluating a case can access materials and what they can expect to find on the case page of candidate. Note that you can filter this list by unit and case type. 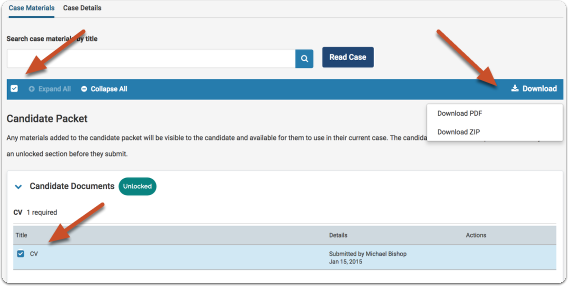 Clicking on the name of the candidate will direct you to the case page, shown below, where you can access materials and forms available to committee members, and view and download materials submitted by a candidate. Note that the case page is a tabbed interface, the "Case Materials" tab, and the "Case Details" tab. The Case Materials tab is divided into two main parts that can each contain one or more sections; the candidate packet, and internal (case) sections. The Candidate Packet is made up of one or more sections the candidate will see when adding materials. 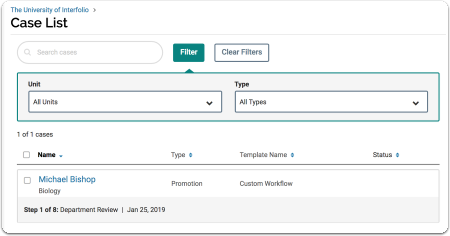 These sections contain materials added to the candidate packet, either by the candidate or on their behalf, and any required forms completed by the candidate. Materials here will be visible to the candidate and available for them to use in their current case. 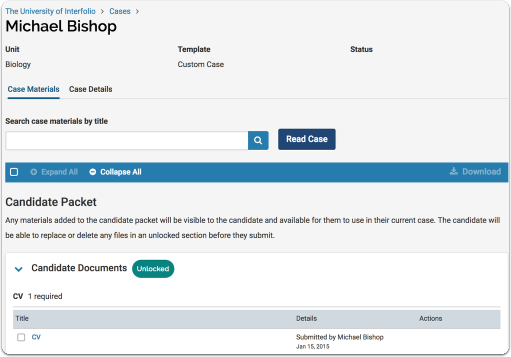 The candidate will be able to replace or delete any files in an unlocked section of the candidate packet before they submit their packet for review. 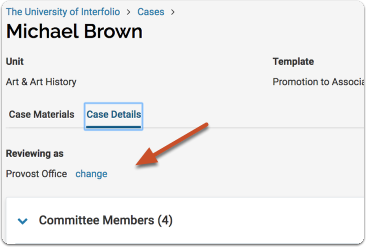 Internal Sections are case sections available to committee members reviewing the case and cannot be viewed by the candidate. Here you will find materials you may need as part of your review such as committee documents. Please note that some materials added to internal sections can be shared with the candidate by an administrator or committee manager. 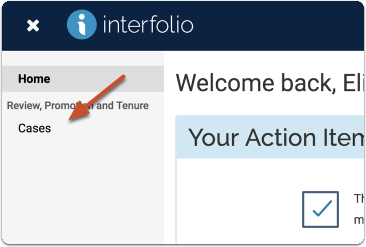 You may see an internal section labeled "External Evaluations" if your institution has elected to use our feature for requesting and collecting evaluations from external reviewers. You may also see a section labeled "Migrated Case Materials." 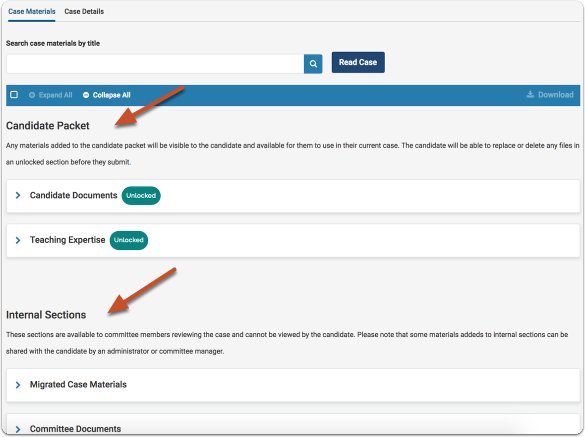 This section contains materials that were originally in the Candidate Packet section, but that we moved as a precaution because materials in the Candidate Packet are visible to the candidate. If a committee vote has taken place and the results have been recorded by the Committee Manager or Administrator, you can also see those results at the bottom of the Case Details tab. 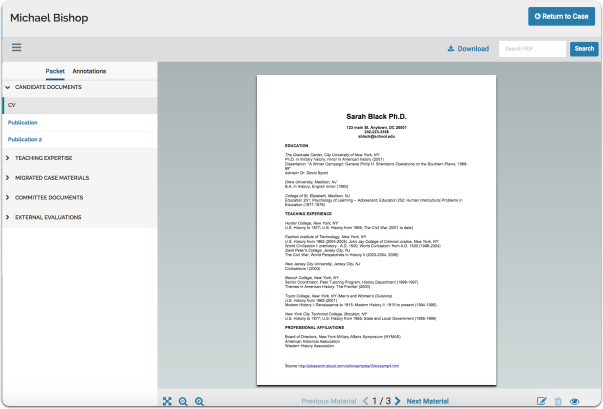 On the "Case Materials' tab of the case page, you can read or download documents that were submitted by the candidate, committee members, and external evaluators. If the institution administering the case has elected not to allow downloading, the Download option will not be available. Some individual documents may also have downloading restricted. You can search for particular case materials by title. This acts as a filter, displaying only materials with a matching title. You can also click on the title of a document to open that specific document in the document viewer. The document viewer displays all materials organized by sections. Note that you can download materials (if enabled), search through the PDF files of materials, and leave annotations on the materials. Click the check box in the blue bar above the list to select all materials listed, or select one or materials to download. Note: Multiple committees can have access to a case at a given case review step. 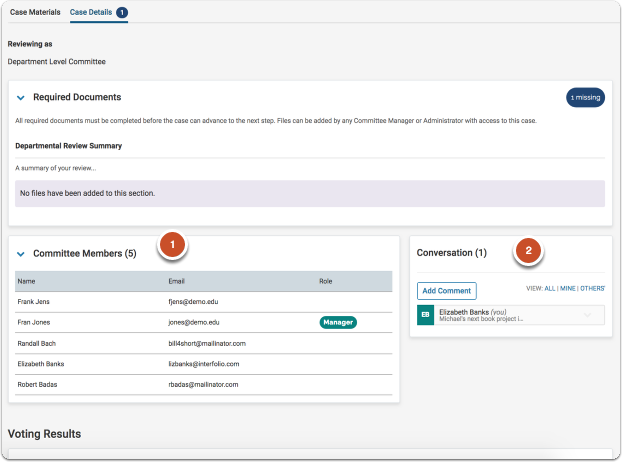 If a user is assigned to more than one committee with access to a case at the same step, they can switch to view the Case page from the perspective of any one of their assigned committees. 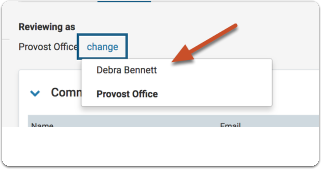 On the "Case Details" tab, look for "Reviewing as..." and click "change"
In the example below, the user has access as both Debra Bennett, and as the Provost Office at this step.